Mash potatoes until they're smooth and free of chunks. Add 1/2 cup half and half cream, butter, egg yolks, and salt. Mix thoroughly to blend. 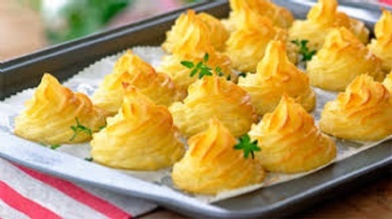 NOTE: You do not want the mashed potatoes to be too soft or they will not hold their shape when baked. Slowly add remaining 1/4 cup half and half cream to the potatoes (you may not need to use all the half and half cream - the potatoes should be stiff). Either spoon or pipe onto parchment-lined baking sheets leaving 2 inches between mounds. Preheat oven to 450 degrees F. Place baking sheet on middle rack and bake for 15 to 20 minutes or until tops are lightly browned.